If you're a summer-loving sun bunny living in the northern hemisphere, chances are that you're absolutely not thinking about wintertime now. At all. These are the days for sipping chilled drinks, stretching toes in sand, and sleeping with the windows open; the days we ached for in the middle of January. That being said, this is also the time of year when farmers' markets abound with summer's bounty—ripe tomatoes, plump pears, crunchy green beans, and so much more. Now is the time to preserve these glorious treasures so that in the depth of winter's cold embrace, we can crack open a jar and celebrate a bit of summertime. 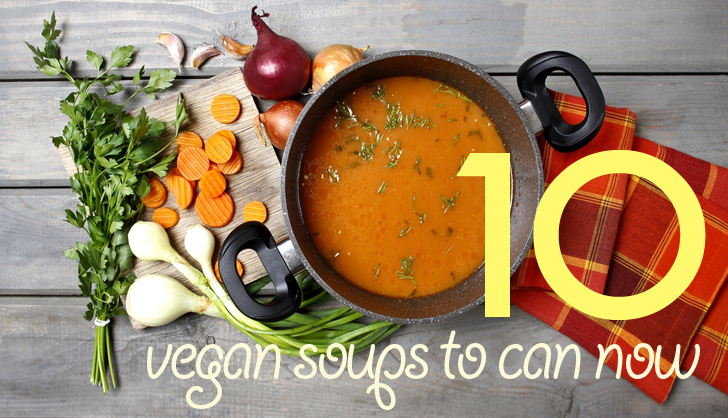 Although these soups are all vegan, they can be adapted to suit individual diets very easily. For example, a lacto-ovo vegetarian might like to grate cheese into their soups, or a paleo diet follower might prefer to use parsnips or sweet potatoes in lieu of regular potatoes. Feel free to tweak these to your tastes! Do try to use organic produce whenever possible, and aim for the ripest, most succulent items you can find. Unlike the pallid, imported veggies we find in supermarkets between November and May, the local items you’ll find at markets during the balmier months are absolutely bursting with flavor. Note that these recipes are for single batches that make about 4 servings apiece. For large batches that are worth canning, just double, triple, or quadruple the ingredients—whatever your largest pot can accommodate. When it comes to canning these, it’s important to follow proper canning procedure both for your area, and the item being processed. Most of these soups are low acid, so they’ll have to be processed with a pressure canner to ensure that they’re safe from botulism and other uglies. The two exceptions are the classic tomato soup, and borscht: these are high-acid soups and can be processed with a water bath method, but I’d suggest pressure-canning them as well just to err on the side of caution. Full quart-sized mason jars will hold enough soup to feed 2-3 people, and you can use either pint- or half-pint jars for single servings—ideal for taking to work or school. 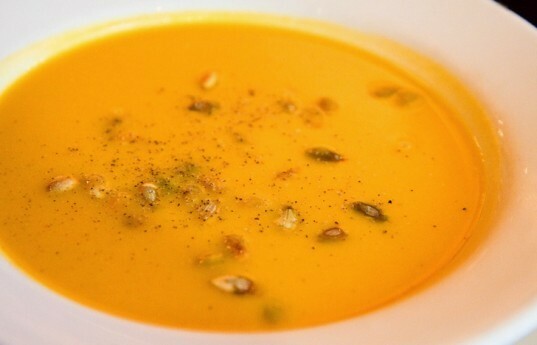 Hearty and filling, this soup is a meal unto itself. Roasting the vegetables beforehand really brings out their flavor, and using different cuts for the veggies themselves is great for adding texture to the soup. Place the garlic cloves, zucchini, squash (or alternatives) and carrot cubes on a baking sheet, toss with olive oil, sprinkle salt on them, and roast them at 400 degrees until they soften and brown a little (usually 8-10 minutes). Allow to cool a bit. Do feel free to mix and match veggies of your choice in here: if you’d like beets, turnips, or parsnips instead of squash or zucchini, knock yourself out. While they’re roasting, sautee the onion and celery in olive oil in your soup pot on medium heat until they’ve softened, then add the stock, tomatoes, canned beans, and green beans. Simmer with the pot covered until the celery is fork-tender (20 or so minutes), and remove from the heat. Add in the roasted vegetables, chopped fresh herbs, and salt/pepper to taste. 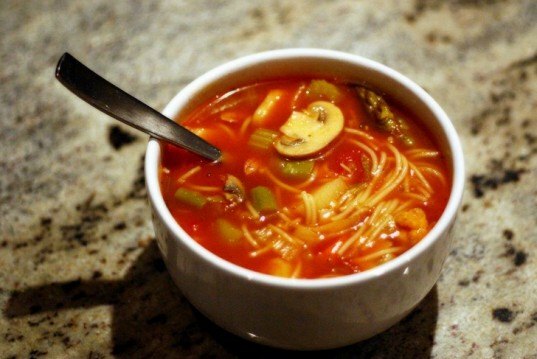 When serving, add 1/2 a cup of cooked pasta of your choice to each bowl, and ladle the soup over it. I like to add a bit of cayenne to mine, and I add in a bit of grated Parmigiano-Reggiano cheese just before serving. You can also stir in a spoonful of pesto just before serving for an added kick of flavor. This gorgeous Moroccan dish is often enjoyed as a first course during Ramadan, and is one of the most comforting, warming soups out there. Sautee the onion in olive oil with cumin until soft, then add the garlic, tomatoes, stock, scallion, chick peas, and lentils. Stir gently, and add the cinnamon, cayenne, and a bit of salt and pepper. Let this simmer on medium heat for 30 minutes until all the flavors have melded and the chick peas have plumped up. Remove from heat, and add in the lemon rind and juice, and a bit of chopped cilantro (if desired). Adjust salt and pepper to taste. I normally add a bit of sriracha or other hot sauce to this because I like it a bit fiery. It’s great served with pita or naan bread, or it can also be thickened into a stew with the addition of cooked quinoa or rice. Sweet and spicy, this is a wonderful autumn pick-me-up as well as a winter warmer. Sautee the onions and carrots together in a bit of olive oil on medium heat, until the onions go translucent and the carrots begin to soften. Add the thyme and ginger, and stir around for a minute or two before adding the vegetable stock. Let this simmer until the carrots break easily when pressed with a fork. Remove from heat, and puree until smooth. Season with salt and pepper to taste. Consider serving this with herbed croutons, or a bit of cashew cream with some chopped parsley as garnish. There aren’t too many people out there who don’t love tomato soup, and with good reason: there’s something so comforting about it, and when made with ripe, gorgeous tomatoes picked right off the vine, it’s absolute poetry. Pair it with a grilled cheese (or Daiya) sandwich to make a full meal, or sip it from a cup as a mid-afternoon pick-me-up. Sautee onion in a bit of olive oil until softened, then add the garlic. Stir for a minute or two, and then add the tomatoes and stock, followed by the thyme. Give it a good stir, then mix the flour with the tomato paste and stir that into the soup. Let this simmer on low-medium heat for 25-30 minutes, then remove from the heat and puree it all until it’s smooth and creamy. Add salt and pepper to taste, and if needed, a bit more tomato paste as well. Chiffonade a few basil leaves and add those into the soup. Bright red and full of iron, this soup is a great cheer inducer on a grey day, and can even be enjoyed chilled on a warm summer evening if you don’t want to wait ’til December to crack open a jar. Sautee the onion in olive oil until softened, then add the beets and carrots. Cook on medium heat for a few minutes, then add 4 cups of stock, beets, potatoes, cabbage, and chopped greens. Add more stock as needed to keep the soup fairly thin. Simmer on medium heat until the beets and cabbage are fork-tender, then remove from heat. Stir in lemon juice or vinegar a tablespoon at a time until desired sourness is reached, and season with salt, pepper, and paprika. Just before canning (or serving), add a bit of chopped dill, if desired. Serve with a dollop of sour cream or yogurt (dairy or vegan). Take the spines out of the kale and chop into ribbons, chop the dandelion coarsely, then peel the broccoli stems and dice them. Sautee the scallions and garlic briefly, then add in the kale, broccoli, and dandelion. Stir these around until the kale starts to wilt, and add in a few cups of stock. (Add less stock for a thicker soup, or more for a thinner one.) Simmer well until the broccoli has softened, then remove from heat and add in the fresh herbs. Puree the soup well, season with salt and pepper, and add more stock, if desired. When you pop open a jar of this a few months down the road, serve it topped with roasted broccoli florets and freshly ground pepper. Do feel free to swap out ingredients to suit your own palate: try celeriac root instead of broccoli, spinach in lieu of dandelion greens, etc. Sweet, crunchy corn is one of summertime’s true delights, and it pairs wonderfully with rich, creamy black beans. If you don’t like cilantro, feel free to leave it out, and you can always tweak the ratios of different ingredients to suit your individual tastes. Sautee the onions in olive oil with the cumin seeds until the onion has softened, and then add garlic and bell pepper. Stir for a couple of minutes, and then add the beans, corn, and tomatoes. Add stock to your desired thickness, and add in the scallion, chili powder, tomato paste, and chipotle pepper. Simmer on medium heat for about 20 minutes, or until the beans have plumped up and the bell pepper is fork-tender. Mash or puree 1/3 of the soup, and adjust liquid as needed. Add the lime juice, cilantro (if desired), and any salt and/or pepper. When you serve this, consider topping it with tortilla chips, a dollop of sour cream or yogurt (soy or dairy) or whipped avocado, some thinly-sliced scallions, and a sprinkle of toasted pumpkin seeds. It’s also fabulous with a bit of grated cheddar/Daiya shreds on top. This is a country classic that’s both simple and economic to make. You can try your own variations with regard to seasonings and serving ideas, though my personal favourite is to garnish it with a bit of cashew cream, and pair it with a thick wedge of gluten-free bread with Earth Balance slathered on it. Drizzle the inside of a large soup pot with olive oil, and sautee the leeks on medium heat until they soften: about 8-10 minutes. Don’t let them brown. Add the potatoes, stock, and dried herbs (if you want them in there), and a bit of salt, cover, and let simmer 35-30 min or until the potatoes fall apart when you prod them with a fork. Remove from the heat, and puree with an immersion blender until smooth. If using a regular blender, pour it all back into the pot after it’s been whirled through. Stir in the soy milk, and season with salt and pepper to taste. 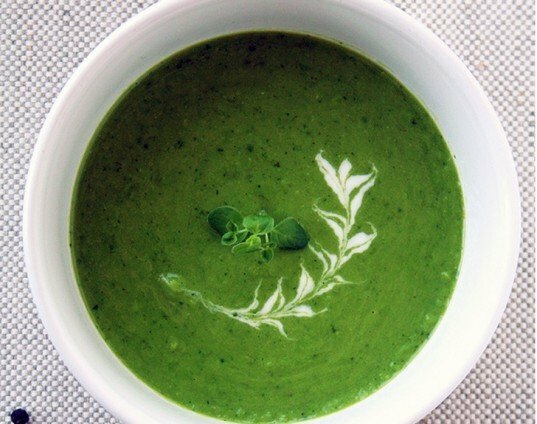 Split pea soup is one of the most warming meals out there, and a bowl of this stuff is like a hug from the inside-out. 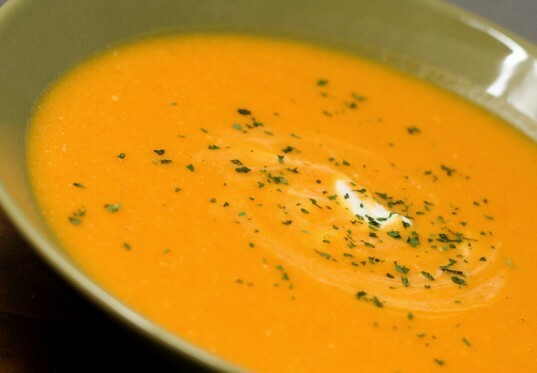 This is the potage that sustained French Canadian farmers for generations, and every region in the province has its own special way of making it. Now, most of the recipes that evolved in Québec are very “oinky”, in that they usually incorporate pork in 2-3 different ways (bacon, ham, jowl…), but that obviously isn’t going to fly for veggievores. We use liquid hickory smoke to give a salty, smoky flavor to the soup without any little piggies joining the pot. Soak the peas according to the instructions on their package, and then drain well. Sautee the onion lightly in a bit of olive oil until softened, then add the vegetables. Toss these around for a couple of minutes, add the stock, bay leaf, and the pre-soaked peas. Cook over medium heat, covered, for about an hour, stirring occasionally, then remove from the heat. Take out the bay leaf, and puree 2/3 of the soup, leaving some bits nice and chunky. Add the hickory smoke and salt/pepper to taste. When you serve this, you can garnish it with some freshly chopped parsley, and either vegan bacon bits or strips of fried smoked tofu. It sounds like a strange combination, but it actually works exceptionally well. Sautee onion in a bit of olive oil in a large soup pot until the onion just begins to go translucent, then add the squash and sweet potato and cook on medium until the onion begins to caramelize. Add the pears, thyme, cinnamon, a pinch of salt, and a bit of pepper, and stir around for another minute or two. Then add the vegetable stock and simmer, covered, for about 30 minutes (or until the squashed and potato are fork-tender). Remove from the heat and puree until the soup is uniformly smooth. When serving, consider swirling a spoonful of coconut milk to each bowl. The potato and leek soup is DELICIOUS! I added home made almond milk to the blender, I don't see why it needed to be stirred in, and I'm so happy with my results! The people who are asking for processing times... the recipes specify to process until smooth and creamy so it's dependent on the blender you are using, unless you are asking how long the entire recipe takes to make. There are no processing times for these soups. What do you suggest? There are no processing times for these soups, also are they for water bath canning or pressure canning? 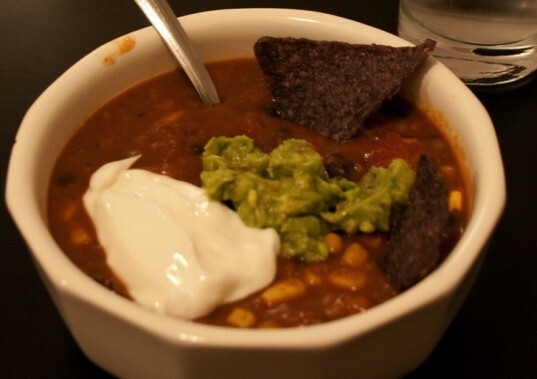 Although these soups are all vegan, they can be adapted to suit individual diets very easily. For example, a lacto-ovo vegetarian might like to grate cheese into their soups, or a paleo diet follower might prefer to use parsnips or sweet potatoes in lieu of regular potatoes. Feel free to tweak these to your tastes! Do try to use organic produce whenever possible, and aim for the ripest, most succulent items you can find. Unlike the pallid, imported veggies we find in supermarkets between November and May, the local items you'll find at markets during the balmier months are absolutely bursting with flavor. When it comes to canning these, it's important to follow proper canning procedure both for your area, and the item being processed. Most of these soups are low acid, so they'll have to be processed with a pressure canner to ensure that they're safe from botulism and other uglies. 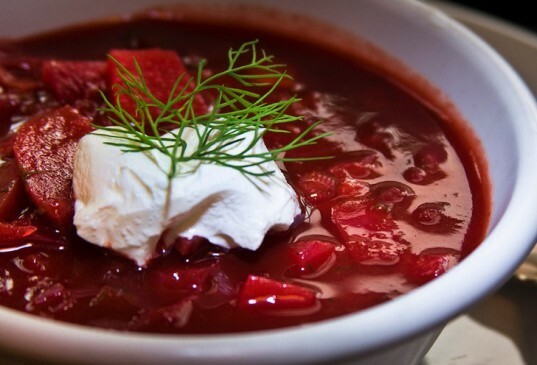 The two exceptions are the classic tomato soup, and borscht: these are high-acid soups and can be processed with a water bath method, but I'd suggest pressure-canning them as well just to err on the side of caution. Full quart-sized mason jars will hold enough soup to feed 2-3 people, and you can use either pint- or half-pint jars for single servings—ideal for taking to work or school. Hearty and filling, this soup is a meal unto itself. Roasting the vegetables beforehand really brings out their flavor, and using different cuts for the veggies themselves is great for adding texture to the soup. 2 zucchinis/courgettes, diced 1 cup squash, pumpkin, summer squash, or eggplant, peeled and diced 1 medium carrot, peeled and diced 1 large onion, diced 4 garlic cloves, peeled and trimmed A handful of green beans, trimmed and cut into 1/2 inch pieces 2 inner celery stalks, sliced thinly 1 can mixed beans, or beans of your choice (cannelini or kidney beans work well in this), drained and rinsed 1 can diced tomatoes with juice 4-5 cups vegetable stock Fresh basil and parsley, chopped finely Salt Pepper Olive Oil Place the garlic cloves, zucchini, squash (or alternatives) and carrot cubes on a baking sheet, toss with olive oil, sprinkle salt on them, and roast them at 400 degrees until they soften and brown a little (usually 8-10 minutes). Allow to cool a bit. Do feel free to mix and match veggies of your choice in here: if you'd like beets, turnips, or parsnips instead of squash or zucchini, knock yourself out. While they're roasting, sautee the onion and celery in olive oil in your soup pot on medium heat until they've softened, then add the stock, tomatoes, canned beans, and green beans. Simmer with the pot covered until the celery is fork-tender (20 or so minutes), and remove from the heat. Add in the roasted vegetables, chopped fresh herbs, and salt/pepper to taste. When serving, add 1/2 a cup of cooked pasta of your choice to each bowl, and ladle the soup over it. I like to add a bit of cayenne to mine, and I add in a bit of grated Parmigiano-Reggiano cheese just before serving. You can also stir in a spoonful of pesto just before serving for an added kick of flavor. 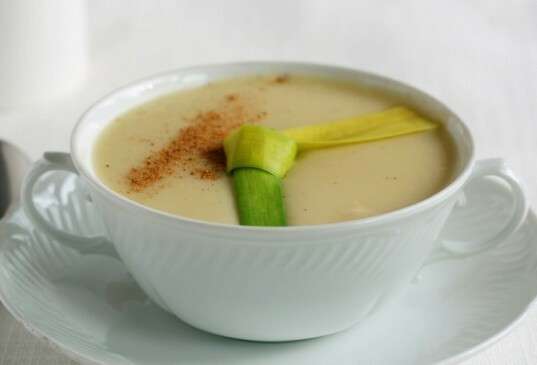 This gorgeous Moroccan dish is often enjoyed as a first course during Ramadan, and is one of the most comforting, warming soups out there. 1 medium onion, chopped 2 garlic cloves, crushed and minced 2 teaspoons ground cumin 1/4 teaspoon cinnamon 1 teaspoon cayenne pepper 1/4 teaspoon ground ginger 1 large can diced tomatoes 1 scallion, sliced finely 2 cups vegetable stock 1 can chick peas, drained and rinsed 1 can of lentils, drained and rinsed Olive Oil 1 teaspoon finely grated lemon rind 1/4 cup lemon juice Salt Pepper Cilantro (optional) Sautee the onion in olive oil with cumin until soft, then add the garlic, tomatoes, stock, scallion, chick peas, and lentils. Stir gently, and add the cinnamon, cayenne, and a bit of salt and pepper. Let this simmer on medium heat for 30 minutes until all the flavors have melded and the chick peas have plumped up. Remove from heat, and add in the lemon rind and juice, and a bit of chopped cilantro (if desired). Adjust salt and pepper to taste. I normally add a bit of sriracha or other hot sauce to this because I like it a bit fiery. 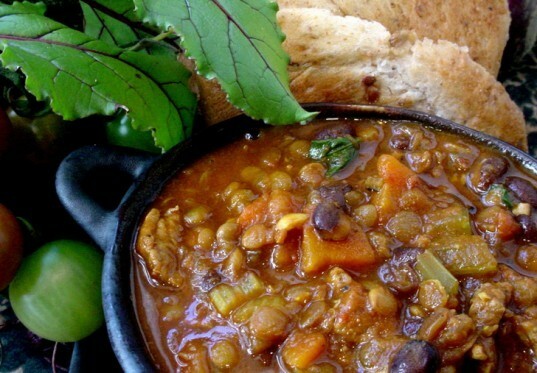 It's great served with pita or naan bread, or it can also be thickened into a stew with the addition of cooked quinoa or rice. Sweet and spicy, this is a wonderful autumn pick-me-up as well as a winter warmer. 1 large or 2 medium onions, chopped 4 cups peeled, sliced carrots 2 tablespoons freshly grated ginger (don't use dried for this recipe) 1 tsp dried thyme, or 2 sprigs fresh 6 cups vegetable stock Salt Pepper Olive Oil Sautee the onions and carrots together in a bit of olive oil on medium heat, until the onions go translucent and the carrots begin to soften. Add the thyme and ginger, and stir around for a minute or two before adding the vegetable stock. Let this simmer until the carrots break easily when pressed with a fork. Remove from heat, and puree until smooth. Season with salt and pepper to taste. There aren't too many people out there who don't love tomato soup, and with good reason: there's something so comforting about it, and when made with ripe, gorgeous tomatoes picked right off the vine, it's absolute poetry. Pair it with a grilled cheese (or Daiya) sandwich to make a full meal, or sip it from a cup as a mid-afternoon pick-me-up. 1 large white onion, chopped 1 large garlic clove, smashed and peeled 2 cans diced tomatoes with juice 3 cups vegetable stock, or broth 1 teaspoon fresh thyme Olive oil 1 tablespoon tomato paste, plus more if desired 1 tablespoon flour (wheat, rice, quinoa, etc.) Salt Pepper Fresh basil leaves Sautee onion in a bit of olive oil until softened, then add the garlic. Stir for a minute or two, and then add the tomatoes and stock, followed by the thyme. Give it a good stir, then mix the flour with the tomato paste and stir that into the soup. Let this simmer on low-medium heat for 25-30 minutes, then remove from the heat and puree it all until it's smooth and creamy. Add salt and pepper to taste, and if needed, a bit more tomato paste as well. Chiffonade a few basil leaves and add those into the soup. Bright red and full of iron, this soup is a great pick-me-up on a grey day, and can even be enjoyed chilled on a warm summer evening if you don't want to wait 'til December to crack open a jar. 3 medium or 2 large beets, peeled and diced 1 medium carrot, peeled and diced 2 large potatoes, peeled and diced 1 large onion, diced 1/2 a head of red cabbage, chopped finely A handful of beet greens, chopped finely (optional—you can use spinach, swiss chard, kale, or escarole instead, or omit entirely) 4-6 cups vegetable stock (onion stock works well for this recipe) 2 scallions, chopped finely White vinegar or lemon juice Olive oil Dill (optional) Salt Pepper Smoked Paprika Sautee the onion in olive oil until softened, then add the beets and carrots. Cook on medium heat for a few minutes, then add 4 cups of stock, beets, potatoes, cabbage, and chopped greens. Add more stock as needed to keep the soup fairly thin. Simmer on medium heat until the beets and cabbage are fork-tender, then remove from heat. Stir in lemon juice or vinegar a tablespoon at a time until desired sourness is reached, and season with salt, pepper, and paprika. Just before canning (or serving), add a bit of chopped dill, if desired. Serve with a dollop of sour cream or yogurt (dairy or vegan). On those afternoons when you're feeling a bit depleted and in need of some green therapy, a bowl of piping hot veggies can do you a world of good. This recipe comes courtesy of Maille Yarwood , chef at Soaring Heart Wellness: A handful each of dinosaur kale, broccoli stems, and dandelion greens A few scallions, chopped 2 cloves of garlic, smashed and diced A big handful of mixed fresh herbs, such as basil, lovage, tarragon, parsley, chervil, sorrel, etc., all torn or chopped coarsely Vegetable stock or broth Olive oil Take the spines out of the kale and chop into ribbons, chop the dandelion coarsely, then peel the broccoli stems and dice them. Sautee the scallions and garlic briefly, then add in the kale, broccoli, and dandelion. Stir these around until the kale starts to wilt, and add in a few cups of stock. (Add less stock for a thicker soup, or more for a thinner one.) Simmer well until the broccoli has softened, then remove from heat and add in the fresh herbs. Puree the soup well, season with salt and pepper, and add more stock, if desired. When you pop open a jar of this a few months down the road, serve it topped with roasted broccoli florets and freshly ground pepper. Do feel free to swap out ingredients to suit your own palate: try celeriac root instead of broccoli, spinach in lieu of dandelion greens, etc. Sweet, crunchy corn is one of summertime's true delights, and it pairs wonderfully with rich, creamy black beans. If you don't like cilantro, feel free to leave it out, and you can always tweak the ratios of different ingredients to suit your individual tastes. 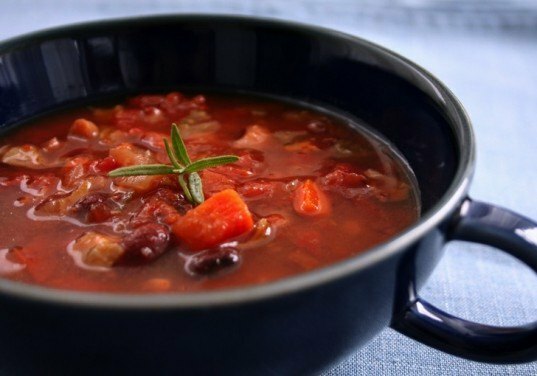 1 can of black beans, drained and rinsed 1 can of organic corn kernels, drained 1 large can of diced tomatoes (or 5-6 fresh tomatoes, blanched, peeled and diced) 4 cups vegetable stock 1 yellow or red bell pepper, diced 1 med-large onion, diced 1 scallion, chopped 2 cloves of garlic, minced 1 tsp cumin seeds 1 tsp chili powder Juice of 1/2 a small lime 1 tablespoon tomato paste Salt Pepper Olive oil 1/2 a chipotle pepper in adobo sauce, minced (optional—leave out if you don't like your soups too spicy) 1/4 cup cilantro, chopped finely (optional) Sautee the onions in olive oil with the cumin seeds until the onion has softened, and then add garlic and bell pepper. Stir for a couple of minutes, and then add the beans, corn, and tomatoes. Add stock to your desired thickness, and add in the scallion, chili powder, tomato paste, and chipotle pepper. Simmer on medium heat for about 20 minutes, or until the beans have plumped up and the bell pepper is fork-tender. Mash or puree 1/3 of the soup, and adjust liquid as needed. Add the lime juice, cilantro (if desired), and any salt and/or pepper. When you serve this, consider topping it with tortilla chips, a dollop of sour cream or yogurt (soy or dairy) or whipped avocado, some thinly-sliced scallions, and a sprinkle of toasted pumpkin seeds. It's also fabulous with a bit of grated cheddar/Daiya shreds on top. This is a country classic that's both simple and economic to make. You can try your own variations with regard to seasonings and serving ideas, though my personal favourite is to garnish it with a bit of cashew cream, and pair it with a thick wedge of gluten-free bread with Earth Balance slathered on it. 3 large or 6 small leeks, white and light green parts only, sliced into half-inch rounds, rinsed and drained well 4 fist-sized potatoes, peeled and diced 3 cups vegetable stock 1 to 1.5 cups unsweetened non-dairy milk (soy or almond seem to work best) Olive oil Salt Pepper Optional: a pinch each of dried summer savory, parsley, and/or chervil Drizzle the inside of a large soup pot with olive oil, and sautee the leeks on medium heat until they soften: about 8-10 minutes. Don't let them brown. Add the potatoes, stock, and dried herbs (if you want them in there), and a bit of salt, cover, and let simmer 35-30 min or until the potatoes fall apart when you prod them with a fork. Remove from the heat, and puree with an immersion blender until smooth. If using a regular blender, pour it all back into the pot after it's been whirled through. Stir in the soy milk, and season with salt and pepper to taste. 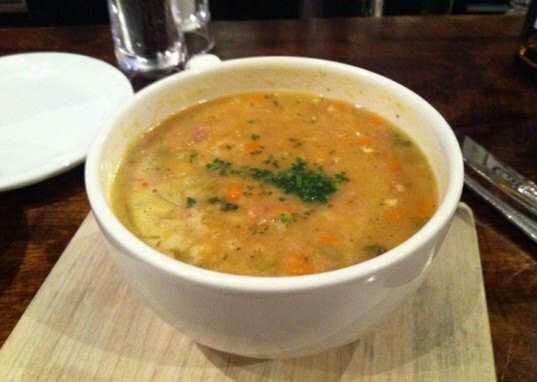 Split pea soup is one of the most warming meals out there, and a bowl of this stuff is like a hug from the inside-out. This is the potage that sustained French Canadian farmers for generations, and every region in the province has its own special way of making it. Now, most of the recipes that evolved in Québec are very "oinky", in that they usually incorporate pork in 2-3 different ways (bacon, ham, jowl...), but that obviously isn't going to fly for veggievores. We use liquid hickory smoke to give a salty, smoky flavor to the soup without any little piggies joining the pot. 2 cups split yellow peas 1 large onion, diced 2 medium-sized potatoes, peeled and diced 2 medium-sized carrots, peeled and diced 1 parsnip, peeled and diced 2 celery stalks (with leaves), sliced thinly 8 cups vegetable stock 1 tsp hickory smoke liquid 1 bay leaf 1/4 teaspoon allspice Salt Pepper Olive oil Soak the peas according to the instructions on their package, and then drain well. Sautee the onion lightly in a bit of olive oil until softened, then add the vegetables. Toss these around for a couple of minutes, add the stock, bay leaf, and the pre-soaked peas. Cook over medium heat, covered, for about an hour, stirring occasionally, then remove from the heat. Take out the bay leaf, and puree 2/3 of the soup, leaving some bits nice and chunky. Add the hickory smoke and salt/pepper to taste. It sounds like a strange combination, but it actually works exceptionally well. 1 medium onion, chopped 1 butternut squash, peeled, seeded, and diced 1 sweet potato, peeled and diced 2 Bosc pears, peeled, cored and diced Olive oil 1/2 teaspoon dried thyme 1/2 teaspoon cinnamon Salt Pepper 6 cups vegetable stock Olive oil Sautee onion in a bit of olive oil in a large soup pot until the onion just begins to go translucent, then add the squash and sweet potato and cook on medium until the onion begins to caramelize. Add the pears, thyme, cinnamon, a pinch of salt, and a bit of pepper, and stir around for another minute or two. Then add the vegetable stock and simmer, covered, for about 30 minutes (or until the squashed and potato are fork-tender). 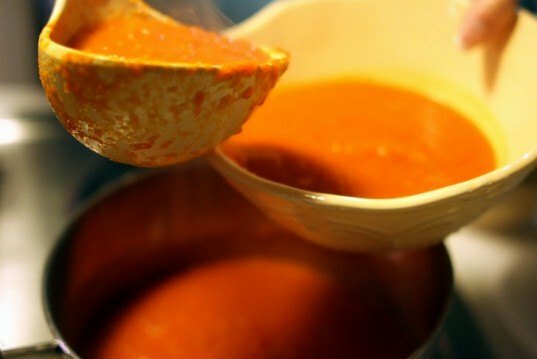 Remove from the heat and puree until the soup is uniformly smooth. When serving, consider swirling a spoonful of coconut milk to each bowl.